This is another in a series brought out by WSC ("When Staturday Comes") Books on European football, and another superb work. (For another success, see Morbo). Interestingly enough, the writer is not the usual British expatriate, but rather a native - but writing in English. Despite the fact that Ulrich Hesse-Lichtenberger (UHL) is not writing in his native tongue, his work has an easily accessible, flowing style, and this makes the book a joy to read. He offers insights from a German perspective, but is conscious that his audience is non-German. At the same time, he does a good job of "defending" German soccer from some of the enduring myths propagated outside Germany, e.g. that German football is "boring and predictable". 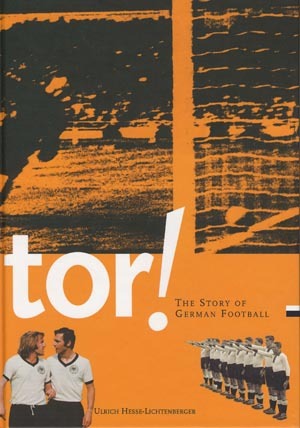 Early chapters discuss the structure of German football, in particular as to the naming of clubs and the "founding date". Contrary to popular opinion, this clearly demonstrates that German bureaucrats have a sense of humour :) The author exhibits his whimsical humour as well. Regarding the rise of hooliganism, UHL offers this superb quote: "It would take a sociological tome to discuss them, and too many trees have already lost their lives because somebody set out to do just that." He then does a good job of offering some explanation, putting it within the context of an Angst-ridden German society of the 1980s. He also dispels some of the myths that have grown up surrounding the Bayern-Gladbach rivalry of the 1970s. Whereas it is now "common knowledge" that Gladbach represented "free-flowing attacking soccer", embodied by Netzer, Bayern was dour, results oriented, perhaps best represented by Schwarzenbeck. UHL rips this to shreds, pointing out (as any football fan who actually watched matches in the 70s already knows) that in fact it was Bayern who scored the most goals and generally attacked. Yes Bayern has in fact come to embody faceless corporate football, but that was a much later development - long after Gladbach had sunk into the sunset. Throughout the book, UHL raises lots of facts and anecdotes that while not critical to the understanding of the game, are nevertheless interesting. For example, the preponderence of red-white uniforms after WWII had a practical reason: since cloth was hard to come by, resourceful club tailors stitched together jersies from the only readily surplused cloth: Nazi flags that were cut up. The last chapter deals specifically with the decline of the national squad, and is very insightful. Most fans today associate German football with cynical hacking and power, combined with luck. Of course, it was not always the case, and in fact the 1972 team was probably one of the most skilled and flowing squads ever assembled anywhere. As a matter of record, the German public has taken umbrage with the "win-at-all-costs" philosophy that has seemingly permeated the national team. This is not unlike the Brazilians and their demand for "jogo bonito" - a demand for stylish, beautiful play, not just winning. UHL lays a lot of the blame on Jupp Derwall, who certainly was one of the more cynical managers and deservedly got canned. However, you could certainly argue that with the exception of Schoen, previous managers such as Nerz and even Herberger at times favored results over style. The author gives Beckenbauer credit for stemming the tide, but most international observers would probably give him mixed marks. While clearly an improvement over the drab Derwall squads, the Beck teams were hardly full of flowing football, despite the availibility of talented players. Of course, the appointment of Vogts turned out to be a total disaster. UHL brings up a good point when mentioning that although Vogts tended to blame the lack of youth players for some of the problems, guess who was DFB Youth coach in the 1980s? UHL also essentially dismisses Erich Ribbeck as a clown, before settling in on Rudi Voeller, who appears to be one of his favorites. Voeller has indeed stabilized the national squad, although their performance still leaves a lot to be desired. The book could have ended on a positive note if it had gone to press a bit later. Perhaps the timing is unfortunate, as one of the last events before going to press was Germany's embarrassing home defeat to England. And yet just a little bit later, England returns from the World Cup like a dog with it's tail between it's legs - and the Germans once again somehow managed to make the final.